Are you marketing your business on social media without a strategy? This is costing you time, effort and money when it should be helping you grow your business. If you want to increase online engagement, improve organic reach and attract more customers, a plan is essential. 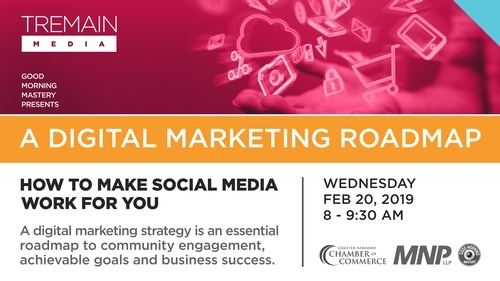 Learn what a digital marketing strategy looks like and how it can shape your social media presence. Think about how to integrate the online platforms you are already using to continually drive people to your business. Set S.M.A.R.T goals to work towards, and discover the analytics you should be paying attention to and how to find them. Everything connected to your business online needs to work in tandem to help you grow. A digital marketing strategy is not just another document - It is a roadmap to community engagement, achievable goals and business success. Prepare to take notes! This will be an information-packed, one hour Good Morning Mastery with Tremain Media. 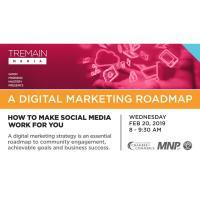 Tremain Media has been teaching sold out workshops on digital marketing and social media for four years. Leah Tremain, one of the instructors, trained directly under Mari Smith, whom Forbes ranks as #4 on their top social media influencers in the world. Tremain Media, which was founded in 2006 has amassed over 12 awards in both local and international competitions including a Nanaimo Chamber Award. Leah is a recognized public speaker, she has gone toe-to-toe with Kevin O'Leary on the Dragon's Den and is a 2x world master champion in the art of Brazilian JiuJitsu. She is featured in the book ?New Pioneers: Stories of BC Women Entrepreneurs" and holds a Master of Education with a specialty in educational video.